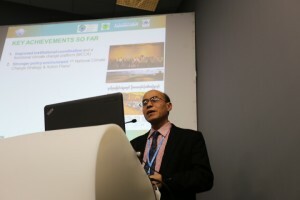 On 2nd December 2015 the Myanmar delegation to COP21 presented the important progress in addressing climate change, achieved with the implementation of the Myan mar Climate Change Alliance Programme, executed by UN-Habitat in partnership with UNEP at the event “GCCA+: a European Union Flagship Initiative Supporting Climate Resilience” held at the EU Pavilion in the COP21 Blue Zone. The Country, engaged in a deep democratic reform process, is considered the 2nd most vulnerable country in the world to the effects of climate change. In 2008, Cyclone Nargis killed 138,000 and th is year floods of unprecedented proportions have affected millions and caused an impact of 2% in its GDP. 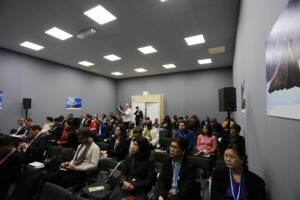 Climate change is very high in the political agenda of the Country, the reason why it launched its Myanmar Climate Change Alliance, implemented by UN-Habitat in partnership with UNEP. The Programme (5 million USD/4 Years) is funded by the European Union/Global Climate Change Alliance and is based within the MoECAF. U Hla Maun g Thein, Deputy-Director General of the Environmental Conservation Department of Ministry of Environmental Conservation and Forestry( MoECAF) showcased the work done for building awareness from national to local level; strengthening policy and institutional capacities at national level and for local adaptation planning; and advancing local eco-system based adaptation. 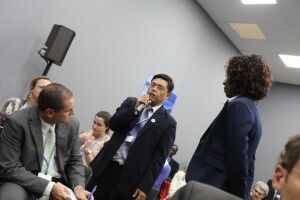 The Myanmar representative showed how, in 2015 the Country through MCCA has formulated and validated its 1st draft of Climate Change Strategy and Action Plan to address these challenges. In 2016 the MCCA will start a programme of capacity building to implement these sectoral action plans. It will also launch a National Awareness Campaign to maximize the work already done in building the awareness of policy makers, communities and public opinion. 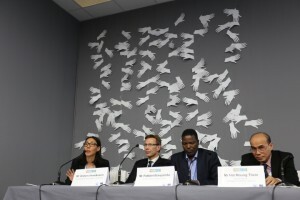 Importantly, it will also continue to develop adaptive capacities a Town and City level, based on the eco-system approach, with concrete and tangible outcomes for the most vulnerable communities in disaster-prone cities. Myanmar shared its experience along with the Maldives and Tchad in front of a numerous attendance, which participated actively in the discussion. Importantly, the EU is engaged in furthering the support to successful programmes through its GCCA+, the next generation of the programme. The Myanmar delegation is briefed by the Vermont Law School on the progress made in the negotiations. MCCA CTA, Mr Capizzi, is embedded in the Myanmar official delegation. MCCA role will be to reflect taken in this historic agreement and the implementation on the ground. Friday the 5th has b een a fairly tense day of negotiation for the country, as the end of week 1 approaches and the agreement text is being prepared for Ministers to negotiate, starting Monday. For Myanmar, the issues of finance, monitoring are crucial and, above all, access to capacities and funds on adaptation.